A high performance damp proof paint for damp proofing and vapour proofing multiple surfaces. 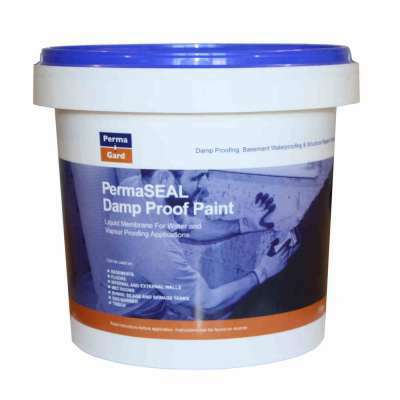 PermaSEAL Damp Proof Paint is a high performance liquid damp proof membrane. Simply brush, roller or spray on to a sound masonry surface to create a damp proof and vapour proof membrane. Our Damp Proof Paint is supplied ready to use straight from the bucket. The consistency is similar to that of thick emulsion paint. It can be supplied as a black or white membrane coating. The membrane is flexible, elastic and is resistant to light abrasion and UV light. It dries to a semi-gloss finish but can also be over-coated when dry with emulsion paints. Note: Please speak with one of our technical advisors if you are considering using this product in a basement situation as there are potential risks involved. A general damp proofing paint for multiple surfaces. Floors: above and below screeds to provide a damp proof membrane. Walls: can be used under a render as a waterproof layer. Externally: below ground a primary waterproofing membrane behind a cavity drain membrane. Tiling: under tiled areas as a secondary protection for wet areas such as bathrooms. Bunds, silage and sewage tanks: protects concrete from silage attack. Gas Barrier: protection against methane and radon penetration. Timber: joist ends can be waterproofed before installation into damp walls. All contact surfaces must be sound, clean and smooth with a trowelled or brushed finish. The substrate must be load-bearing, sound, free of loose material, dust, oil, grease, rubber marks and other substances with a parting effect. Any masonry should be flush and pointed with any defects in existing surfaces made good. Remove any laitance, dust, loose material and surface water. Please note: Permaseal Damp Proof Paint should not be applied over any previous coatings e.g. emulsion paints, bitumen, oil, grease, rubber marks and other substances with a parting effect. The membrane may be applied by brush, roller or airless spray. When applying two or more coats, it is recommended that subsequent coats are applied at right angles to the previous coat. Before applying a second coat, it is necessary to allow the first coat to become touch dry, typically one hour. The second coat should be applied within 24 hours of applying the first coat. To achieve a damp proof barrier, PermaSEAL Damp Proof Paint must be applied as specified and not stretched to cover larger areas. For the dry film thickness to be 0.6mm, the wet film thickness needs to be 1.1mm. This will be achieved at a coverage rate of 1 litre/m² applied in two coats each of 0.5 litres /m². For the application of a dry film thickness of greater than 0.3mm in a single coat it is recommended that the membrane is applied by airless spray. Using airless spray, a single application dry coat thickness up to 1mm may be achieved. 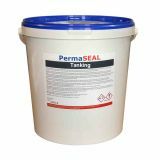 For areas of water ingress under hydrostatic pressure we suggest the use of Permaseal Tanking as a waterproof barrier. Return to our Damp Proofing section to browse more products or read our Guide to Internal Damp Proofing. If you still have questions then read our article on Does Damp Proof Paint Really Work? or contact one of the team for free advice. 10m² per 5 litre container or 5m² for two coats. This product should be applied in a minimum of two coats, each of 0.5 litres/m². I was trying to solve a damp problem on a chimney breast in a previously neglected house. A leaking gutter had poured rain onto the outside wall for years. A year after renovation, the chimney breast was still damp. I really appreciated the advice available from Permaguard technical people that it could take months more to dry. I applied the damp proof membrane to the external wall 6 months ago and salt neutraliser on the inside. The damp then seemed to get worse for many weeks as it was drawn through to the inside, but eventually dried and stayed dry. I've applied this damp proof paint for good measure to ensure no stain comes through any decoration, but I only needed a small amount. It would be great to be able to buy this and the other Permaguard products in small quantities. Most will be wasted. I also struggled with the lid and couldn't get it off but realised I could pull up the spout under the red cover and then pour some into a paint tub. Some instructions on opening would be very useful. Good Stuff, what's not to like? Bought 6 cans and it was an absolute pain in the nether regions trying to get the lid off the cans. Is it just me or does anyone else have the same trouble? Had to spend a good 10 minutes with screwdrivers, water pump pliers and chisels just trying to get the cans open! Having said that, the rest was a breeze, paint went on like a dream liberally with brush and roller, easy to apply, does what it says on the tin, am well happy if somewhat knackered! I was recommended to use this product under a replacement parquet floor in our lounge. The original was damaged by damp coming up through the concrete slab. The damp proof paint was very easy to apply (like emulsion paint). We applied two coats in three hours then laid our floor the next day. I now feel very confident that damp will not damage the floor again. Thank you Permagard. Used as a wet room paint, easy to apply, quick drying, got two coats on in 2 hours then tiled over. Used what I had left to cover water marks on the ceiling below the bathroom then painted over with standard magnolia emulsion to match the rest of the ceiling. I purchased this product to use on the inside wall of my garage to cover up damp patches that appear when it rains heavily on the external wall. I applied two coats as per the data sheet and it has stoped the damp showing when it rains. Very easy to apply, I managed to get two coats on in one day. Thank you to the technical team for their help and advice.